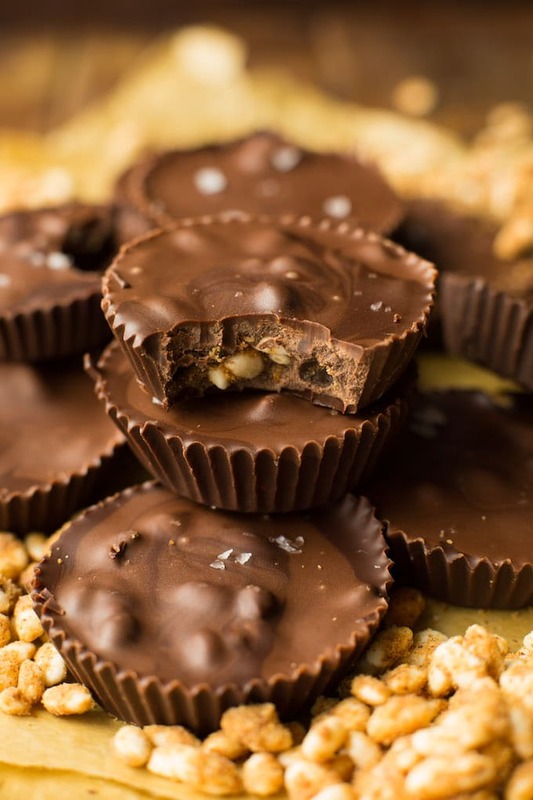 Because when one candy bar isn’t enough you’ve got no choice left but to fuse them together into one glorious peanut butter crunch chocolate cup. I bought a bad of puffed rice cereal quite a few weeks ago, but they’ve just been sitting in our cupboard waiting a little inspiration. I think I might be showing just how basic I am right now by admitting that peanut butter & chocolate is my inspiration – but there ya go! These chocolate cups are suuuuper easy to make and require a grand total of only four ingredients! 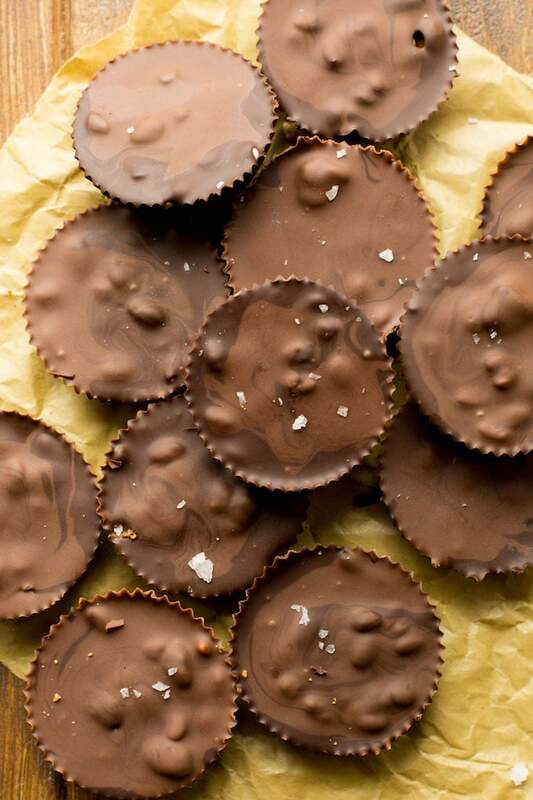 Making these can be broken up into two main steps: the peanut butter crunch & the chocolate. Both steps are pretty easy – it’s mostly just a matter of melting and mixing on both fronts. Really, the hardest part here will just be letting things cool and set before eating. Just one more note: If you’re wondering why the tops of my chocolate cups have a two tone swirl it’s because my husband has a tendency to eat my baking chocolate if I don’t hide it from him. I ended up needing to melt a different kind of chocolate that wasn’t quite as dark for the tops. 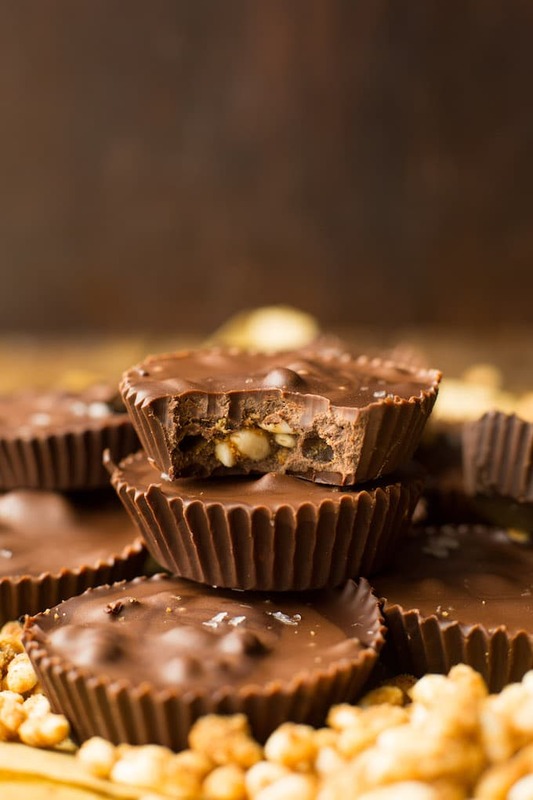 I hope you like these peanut butter crunch cups as much as we do! If you’re as much of a fiend for crunchy foods than I am then you’re going to love these. 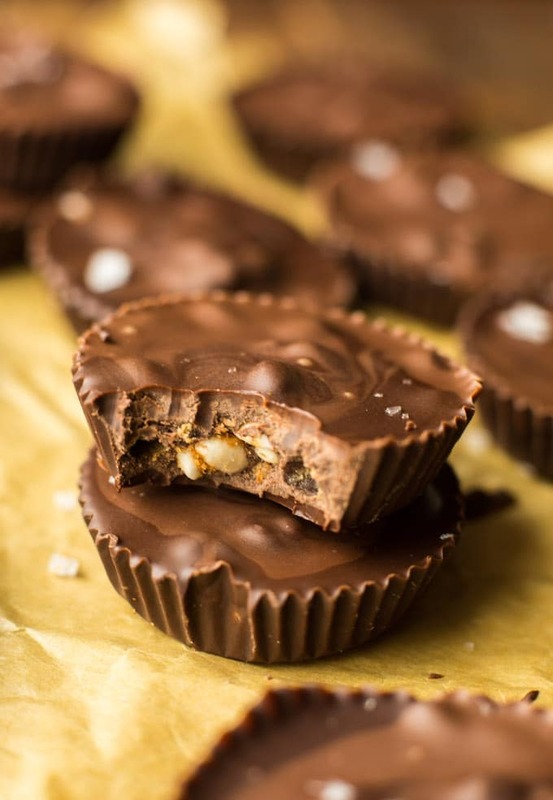 Don’t forget to #asaucykitchen on instagram if you try these Peanut Butter Crunch Chocolate Cups! I’d love to see what you make with it! You can also post your pictures to my facebook page! In a small pot melt the peanut butter and coconut sugar on a low heat. Use a wooden spoon to stir until combined. Remove the pot from the heat and stir in the rice crispies until coated. Transfer the peanut butter crispie mixture to a small bowl and set aside to cool. Clean the a small pot you were just using and fill it with water. Bring to a simmer on the stove top. While the water is heating up, break your chocolate up and place in a heat proof bowl. After the water in the pot reaches a simmer, place the heat proof bowl over the water. Stir the chocolate occasionally to help it melt evenly. Once it's completely melted remove it from the heat and set it aside until it's cool enough to handle. Line a cupcake/muffin tin with liners. Pour a small amount of chocolate into the paper liners - just enough to cover the bottom of the liners. Add a small spoonful of the rice crispy filling onto the centre of each chocolate cup. Once each cup is filled with the rice crispies pour just enough of the chocolate to cover the tops. Place the cups back in the fridge for another 15 minutes to harden once more. If you're wondering why the tops of my chocolate cups have a two tone swirl it's because my husband ate some of my chocolate I keep for making recipes so I had to melt a little extra chocolate that wasn't quite as dark. Where do you find the puff rice cereal? These are beautiful! 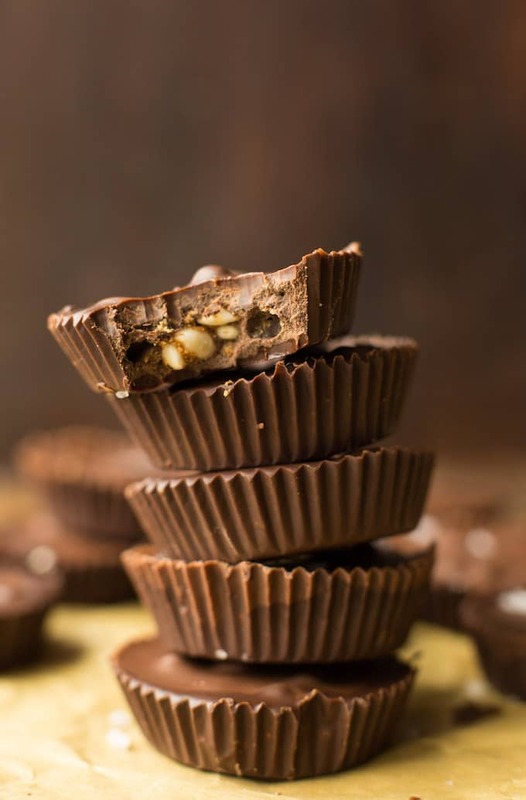 I love the contrasting flavors and textures in these delicious homemade chocolate cups!